Devi Ahilya Vishwavidyalaya has emerged as a premier institution of higher learning in Central India by creating, advancing and disseminating knowledge. University has been creating, advancing and disseminating knowledge since 1964. University initially started with few departments, now has 27 teaching departments and offers undergraduate, post-graduate and research programmes in 16 Faculties. The University has a number of supporting centers including Directorate of Distance Education, and Directorate of Physical Education and Sports. The sports department conducts the number of national competitive events as per the Association of Indian Universities guidelines. University mentors the students through Career Counseling and Opportunities Guidance cell, Equal Opportunity Cell, and National Service Scheme Units. University offers a number of support services through Health Centre, Day Care Centre, University Cultural Centre, and Student Welfare Department. Academic Staff College (ASC) and Educational Multimedia Research Centre (EMRC) of the University are fully supported by the UGC. Most of the departments have research projects sponsored by various funding agencies such as UGC, CSIR, DBT, ICAR, DST, ICSSR and MPCOST etc. Four of its teaching departments are supported under UGC-SAP, one Center for Potential of 3 Excellence in e-Management Studies set-up with UGC support, two under DSTFIST and one by DBT. State Planning Commission has created one Chair on Micro Economic Governance in the School of Economics in 2012 while the School of Education has been upgraded to Institute of Advanced Studies in Education by MHRD in 2013. P.G.Diploma: Population Education and Demography / Advanced Translational and Functional Hindi / Guidance and Counseling / Human Rights / Labour Law & Personnel Management / Yoga Therapy, P.G.D.C.A. DAVV DET is short for Devi Ahilya Vishwa Vidyalaya Doctoral Entrance Test (DET). The University organizes this test to let eligible candidates take admissions into Ph.D./M.Phil. programme. The duration of doctoral entrance examination test will be of two hours, where candidates have to attempt two sections A & B each section consist of 50 objective type compulsory questions of 1 mark each based on research methodology for Part A and syllabus of the subject at Masters level for Part B. Later, Final list of selected candidates will be prepared on the basis of performance of candidates in entrance test & Interview. 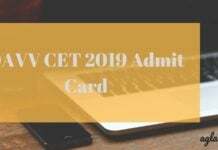 DAVV CET or Devi Ahilya Vishwa Vidyalaya Common Entrance Test is conducted every year for candidates who are willing to take admission into Devi Ahilya Vishwa Vidyalaya for any of its undergraduate and postgraduate programmes. The university releases application form for the entrance test online on the official website www.dauniv.ac.in for candidates to apply through online mode only. last year DAVV CET was conducted in 27 different cities for the convenience of candidates. The examination result declared on the official website within a few days of entrance examination. 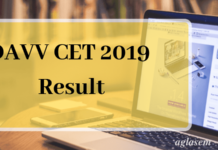 DAVV CET 2019 Result – Check Your Scores From Here! 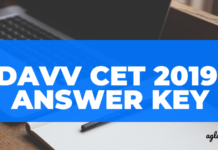 DAVV CET 2019 Answer Key – Estimate Your Scores From Here!